Sciatica and low back pain often go together, but sciatica is far less common. While 80% of people experience low back pain at some point in their lives, only 2-3% will actually develop sciatica. Although finding the cause of sciatica is often tricky, but once the expert succeeds in pinpointing it, sciatica can be cured. Rest and ice: Reduce muscle inflammation and pain using ice pack for 20 minutes several times a day during the first 48 to 72 hours. See RICE protocol to know more. Heat: After 3 days, a heating pad may be added on low setting to reduce the muscle spasm. Rest: A short period of bed rest is okay but anything more than a couple of days does more harm than good. If the self care treatment doesn’t work within first couple of days, always visit your doctor and consult a Physiotherapist for exercise advice. Bed rest may provide some temporary pain relief. Patients may rest for a day or two after their sciatic pain flares up, but after that time period, inactivity will usually make the pain worse. Exercise is usually better for relieving sciatic pain than bed rest. Without exercise and movement, the back muscles and spinal structures become weak and less able to support the back, that can lead to back injury and strain, which causes additional pain. Physiotherapy guided exercises will systematically work on your spine to keep the discs healthy and prevent pressure on the sciatic nerve and relieve pain. Call +91 992099 1584 and we will get you started with your sciatica treatment with a physiotherapist near you. Sciatica can potentially go away on its own, and in many cases surgery is not needed. Many people find that they feel much better within four to six weeks. The duration of sciatica depends on several factors, because the condition can be acute or chronic. In acute cases, the attacks can last anywhere from several days to weeks. But in chronic sciatica, the pain can last for more than three months and the pain can worsen further due to certain movements. How does physiotherapy benefit in Sciatica treatment? Ultrasound: decrease healing time and relieve stiff and inflexible muscles by improving the circulation and gently heating the muscle. Transcutaneous Electrical Nerve Stimulation (TENS): In some cases using a very small and controlled amount of electricity can decrease the intensity and muscle spasms . Nerve Gliding Activities: Exercises that move and "glide" your nerves. Nerve gliding focuses on allowing the nerves to move more easily as you bend and straighten your joints. Mobilisation techniques to increase joint mobility and correct joint mechanics. McKenzie exercises and Dynamic Lumbar Stabilization: Strengthen the spinal column and the supporting muscles, ligaments and tendons, the abdominal muscles, gluteus and hip muscles. Posture correction and spinal stabilisation : Focusing on core muscles — the muscles in your abdomen and lower back that are essential for proper posture and alignment. Thousands of our patients have found great relief from pain caused due to Sciatica and we will be happy to help you too. Call us at +91 992099 1584 and we will connect you to a physiotherapist close to you. 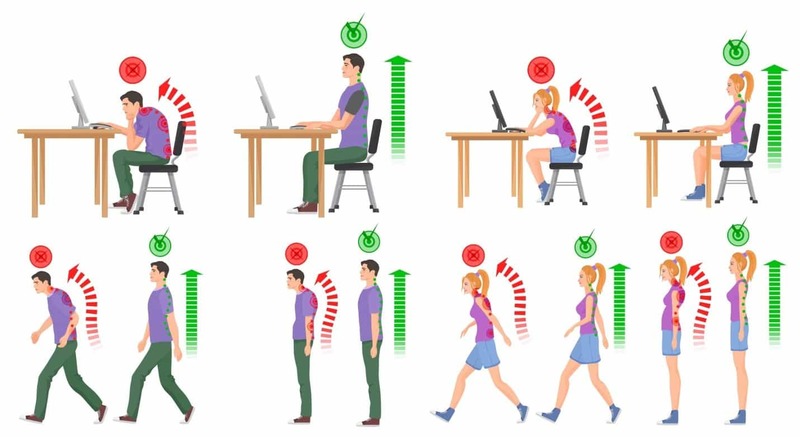 Use of proper lifting techniques and avoid prolonged sitting and standing. Good posture during sitting, standing, sleeping and maintaining the same. Using cold or heat depends upon the condition. First use ice pack to reduce muscle inflammation and pain. Put oce pack for 20 minutes several times a day during the first 48 to 72 hours. Thereafter, a heating pad may be added on low setting to reduce the muscle spasm. Walking can relieve your sciatic pain by spurring the release of pain-fighting endorphins and reducing inflammation. On the other hand, poor walking form may aggravate your sciatica symptoms. So, correct technique is important. Leg pain can also be caused due to a joint problem in the hip or sacroiliac joint. This type of referred pain is quiet common, but is not sciatica. Sciatica most commonly occurs when a herniated disk or a bone spur on the spine compresses part of the nerve causing inflammation, pain and numbness in the affected leg. Pain will vary widely from a mild ache to a sharp, burning sensation or excruciating discomfort. Sometimes it may feel like a jolt or electric shock. It may be worse when you cough or sneeze, prolonged sitting and activities like bending forward can aggravate symptoms. Sciatica can potentially go away on its own. Many people find that they feel much better within four to six weeks. Although finding the cause of sciatica is often tricky, but once the expert succeeds in pinpointing it, sciatica can be cured. Physiotherapy can help you return to your full functional activities and prevent re-injury. Ultrasound, heat therapy, traction, SWD, IFT and TENS may be recommended depending upon the type and area of pain for pain reduction and reliving muscle spasm. Exercises including abdomen, low back and lower limb muscle strengthening and stretching and aerobic exercises (may begin within 2 weeks of symptoms) become the central component of sciatica treatment. Call us at 9920991584 and we will get you started with your recovery with a physiotherapist near you. Age: Sciatica is rare before 20 years of age, the highest incidence is found in 50s and then decreases with increasing age. Prolonged sitting : Surprisingly occupations with greater physical labor, such as carpenters and machine operators, have a higher likelihood of developing sciatica compared to less mobile office workers. Sometimes Pregnancy may also aggravate sciatica pain. Sciatica is mainly diagnosed by history taking and physical examination. By definition patients mention radiating pain in the leg. They may be asked to report the distribution of the pain and whether it radiates below the knee and drawings may be used to evaluate the distribution. Patients may also report sensory symptoms. Physical examination largely depends on neurological testing. Patients with sciatica may also have low back pain but this is usually less severe than the leg pain. Imaging tests such as CT or MRI can help with the diagnosis of lumbar disc herniation. This article is based on the inputs from Dr Swapnaja Joshi (PT). Dr Swapnaja is a dynamic physiotherapist with experience in musculoskeletal issues as well as women’s issues. She is liked by her patients particularly for her empathy and compassion. बैल अंगघात (Bell’s palsy/ बेल्स पाल्सी ) चेहरे के पक्षाघात का एक प्रकार है। Learn in Hindi its treatment, symptoms and home care.